These are about the smallest sized garlic cloves that I would plant in the spring. I was a startled the other day as I was putting on my coat getting ready to go outside. It was quiet in the house and I was the only one home. All of a sudden I heard a snap and the clickey-clack sound of what sounded like small beads landing on the table and front entry tile floor. At first I thought maybe the cat had discovered something and was playing. I often blame the cat for things but to be honest, he very rarely is at fault. I looked up thinking a part the ceiling lamp had disintegrated or one of the lights failed however, everything was intact. It took a few minutes of investigating but I found out what caused the mysterious sound. Scattered around on the floor and furniture I found a whole slew of seeds that I quickly realized were lupine seeds. 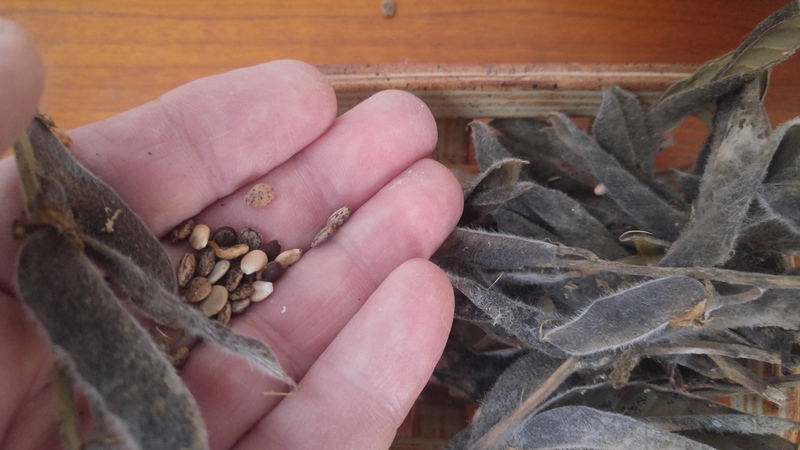 Earlier this fall we collected some lupine seed pods from a roadside near us hoping to re-establish a Lupine perennis population on our property. When we got home, we put the pods in a bowl on the table in the front entry and just forgot all about them. Plants have many ways of spreading their seeds. For example, squirrels bury acorns, maple trees have those little helicopters thingys and milkweed uses silky parashoots that are carried by the wind. Other seeds stick to animals or pass through the digestive systems of birds and are dropped far away from the parent plant. Here’s a few lupine seeds that I found scattered around the house. They are explosively thrown from the fuzzy pods when they’re ripe. Lupine seed pods explode when they mature, throwing seeds several feet in all directions. Botanists call this spontaneous phenomenon dehiscence. You may have seen this with other plants such as impatiens or sorrels. In this case, inside the house, it was very surprising. I made a mental note to make sure I told my wife about it but, through the course of a busy day, I forgot about it. Later that evening when were binge watching Blue Bloods, all of a sudden we heard a snap! and the clicking sound of seeds bouncing off of the walls. Another seed pod exploded ricocheting seeds all over the place. It was then I remembered what it was I meant to tell her. The mystery sound was solved and the cat was once again vindicated. Our Indian summer is here for several more days but it won’t last forever. Frost hit in some low lying areas a week or so ago but many gardens are still going strong. Some plants in the vegetable garden can tolerate light frost; others have no resistance to it. Basil is one of those crops that can’t take even a hint of frost. Last week I chopped a quart of fresh basil and poured olive oil over it to keep it fresh. There is nothing new to this method. For years, people have been preserving basil in olive oil. I found out just recently that botulism could form in the basil-oil mixture if it is kept at room temperatures for more than a few days. Even if the mixture is refrigerated, botulism can grow. The only safe way to keep basil and oil mix is in the freezer. I froze a couple of pint jars and brought one out today just to check it. It’s frozen solid; I’ll have to let it thaw a little before it will be easy enough to scoop out. A jar of frozen basil-olive oil mix, right out of the freezer. Some people put their basil-oil mix into ice cube trays and then freeze it. Later, they take cubes out of the freezer as they need them. Next year I think I’ll watch out for ice cubes at the garage sales. 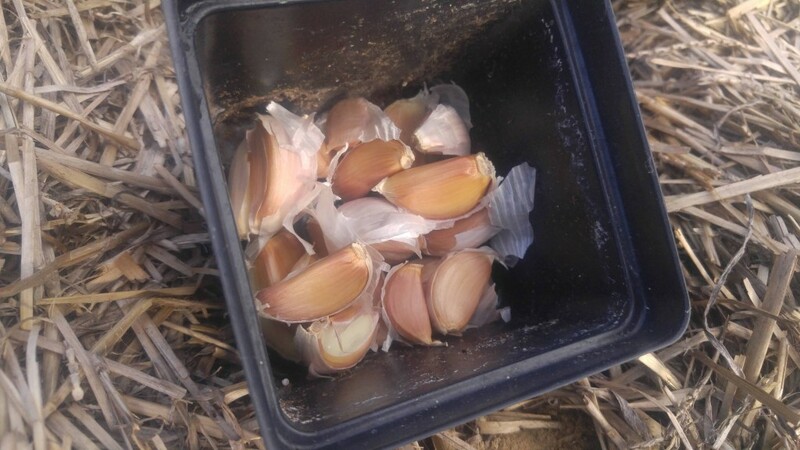 In past years I have written about the subject of planting garlic. I think it never hurts to remind experienced gardeners that they need to get that garlic in now. Also, there may be new readers that would like to try their hand at growing their own garlic. To grow garlic like these, you need to follow a few simple guidelines. To get garlic like those shown in the photo, you need to follow just a few simple guidelines. The most important thing to keep in mind is that garlic needs to be planted in the fall. That means if you are thinking about doing it, now’s the time. Fall planting allows the plant to establish roots before the ground freezes. You can plant garlic in the spring but keep in mind that the bulbs will be quite a bit smaller that if you planted now. Don’t wait too late in the season either. 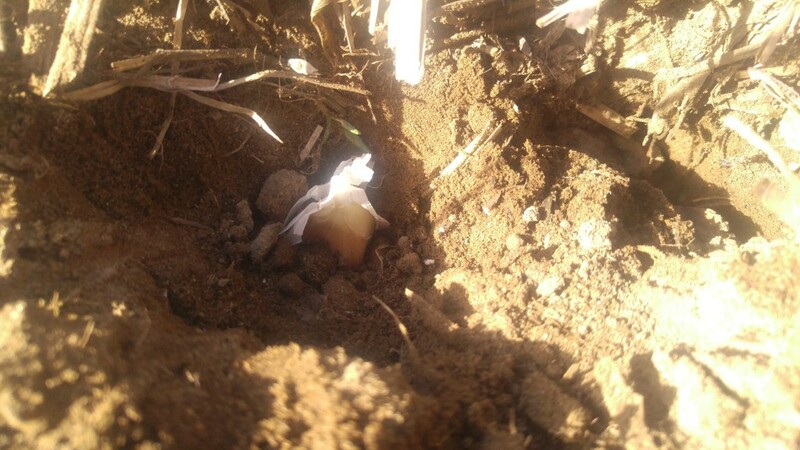 Planting too late in the fall will have similar results as spring planting… small bulbs. I should mention that garlic is planted from cloves separated from a garlic bulb. If you are planting a small crop, one or two bulbs from the grocery store will work fine. So called seed garlic is available from seed suppliers for those who want to plant a larger amount. Since garlic is considered a heavy feeder, be sure the area you select has fertile soil and full sun. Addition of manure or compost is always a good idea. After separating the cloves, place them into the soil at a depth of one to two inches. You can dig a furrow and set the cloves into it or just push them into the soil. They need to be about six inches apart so they have room to grow next spring. The space between the rows should be at least six inches or more depending on the amount of space you have. Once the soil freezes, mulch the area with straw, leaves, grass clippings or something similar to a depth of four to six inches. Your new garlic will be happily tucked away and protected against the harsh winter conditions and freezing and thawing cycles. Next spring rake off the mulch to let them begin their growth. Keep in mind that garlic cannot compete against weeds. Any weeds present will drastically reduce your harvest. Here we are, it’s the last day of November and I just got our garlic in the ground a few days ago. Regular readers of this blog already know that fall is the time of year that you plant garlic. Garlic can be planted in the spring, however you will end up with bulbs half the size of those planted in the fall. I think there is still some time to get your garlic planted, I wouldn’t wait too much longer though. If you have a helper in the garden, decide who is going to go out and find some garlic cloves to plant while the other stays behind and prepares the area to be planted. If you are by yourself,well then, you’ll have to do both. Check the garden centers for garlic cloves, if they are out, a farmer’s market stand may have some that can be used for planting. The garlic purchased in a grocery store produce department will most likely have been treated with a sprout inhibitor and will not be good for planting. Sprouting is what we want. I used my garlic that I saved from this years crop. Your garlic spot must be free of all weeds and kept that way during the growing season because garlic does not compete well against weeds. If you are planning on amending your soil with compost or peat, now’s the time to do so. Break apart the garlic bulbs into individual cloves just as you do in the kitchen, only this time you won’t be running them through the garlic press. Plant the cloves into the soil about 2 inches deep and about 6 inches apart. Place the root end down. 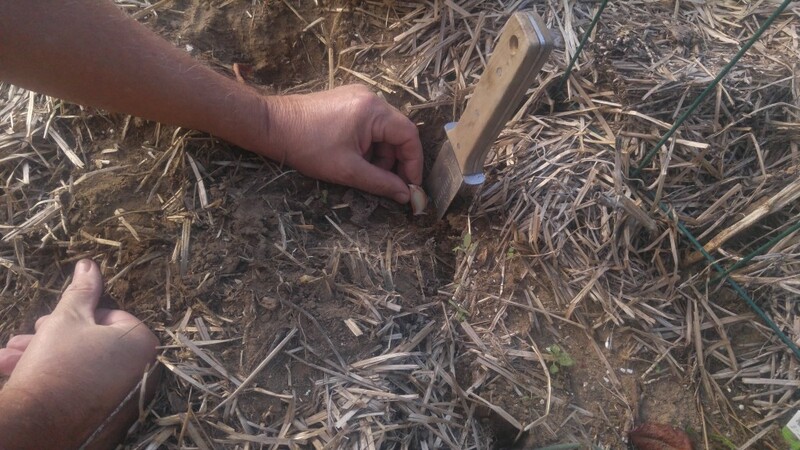 You can just push them down into the soil with your finger or dig a furrow like I did here. Cover them up with soil and let them go until the soil freezes. During this period, the cloves will grow roots. Hopefully we will have a mild December which will allow our late planted garlic some time to develop those roots. No fertilizer is needed for now, we’ll apply that in the spring. Once the ground freezes, cover the bed with straw, compost or other type of mulch. 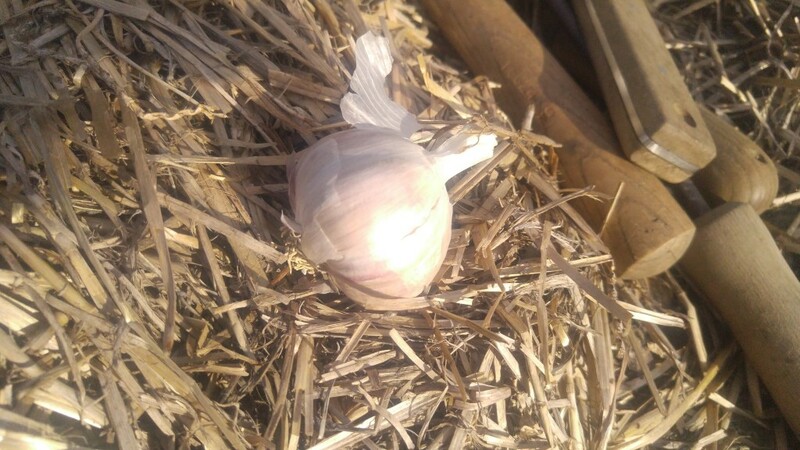 It’s much better for the garlic if the soil is kept at a consistently cold temperature (which the mulch will provide) than to be freezing and thawing over and over through the winter. In the spring we will remove our mulch and add fertilizer, garlic is a crop that needs a lot of plant food. We’ll revisit this project again at mulching time and fertilizing time. …the garlic bulbs that is. Today we mulched our garlic beds. The raised beds we have for vegetable production measure about 5’x9′. Five pounds of garlic bulbs plant six of these beds exactly. We used wheat straw about 6′”-8″ deep to cover these six beds. Four moderately heavy bales did the trick. By the way, these bales of straw were of the most beautiful golden wheat color I have seen in a long time. In a way it was amost a shame to use them for mulch, but that’s what they’re there for. The bright color ensures that we don’t import a new batch of weed seeds from weed stalks that could have been baled up out in the field by the farmer along with the straw. Straw that has lots of different color stems in the bale more than likely are contaminated with weeds. If you promise not to tell anyone, I”ll let you know the secret to growing super size and delicious garlic. So just let me know if you can “keep it under your hat”, by writing me a short note in the comment section that you like garlic.